September 12 - The Holy Name of Mary - Optional Memorial - My Catholic Life! A name doesn’t imply that you know everything about someone, but it does make a person “invocable.” To know that there is a “someone” standing before you is not to know too much. When that “someone” has a name, however, he or she is placed in relationship with you, and relationships are what matter most. By means of a name we go beyond a mere concept, beyond a mere thing. A name includes another in our circle of shared existence. No one wants to be a mere number, or to be just a “Nigerian,” just an “athlete,”or just an “accountant.” Titles and monikers flatten people. They reduce someone to where they came from, what they excel at, their profession, their hair color, their language, and on and on. A name opens a door to the more complex reality that is every human soul. The God of Christianity is not a mere concept who does. He is a being who is. He has a name. He is “Abba” or “Father.” He is Jesus Christ. He is the Holy Spirit. It’s hard to imagine truly knowing, or loving, a nameless entity whose identity is his function. We don’t, after all, love “country.” We love Poland, or the Philippines, or Bolivia. And we don’t love “husband” or “wife,” we love the concrete, specific, named person we are married to. We love God for the same reason we love people, because we know His, and their, name(s). Jesus Himself called out “Mary!”in the garden on the morning of His resurrection, and the name elicited a beautiful response: “Rabboni!” In Chapter Three of the Book of Exodus, Moses is called by God, by name, to approach Him in the burning bush. God first states that He is the God of Abraham, Isaac, and Jacob. But Moses is not completely satisfied with knowing that God is, or for whom He is. So Moses asks the question everyone asks when they want to deepen a relationship: “What’s your name?” God then pulls the curtain aside and invites Moses into His inner life, into relationship with Him. He reveals something more intimate. He tells Moses His name—“Yahweh” or “I am Who Am.” God hands over part of Himself to man. He can now be called upon. He is invocable. No one can make you reveal your name. It’s personal. To reveal your name is to become more vulnerable. Today the Church commemorates a name, as much as the person who bears it. The holiness of the name of God, which the Second Commandment forbids man to take in vain, is reflected in the holy names of all the saints and holy things and holy places dedicated to Him. The name of the Mother of God, the Holy or Blessed Virgin Mary, should be safe in our mouths. This feast falls during the Octave of the Birthday of the Virgin Mary. It was inserted into the Church’s universal calendar just after the triumph of the Christian army over the Turks at the battle of Vienna in 1683. The feast was suppressed after Vatican II but once again placed in the calendar by Pope Saint John Paul II in 2002. Mary’s name evokes tenderness and maternity. 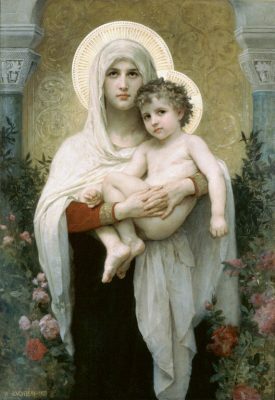 All Christians should call upon the Blessed name of the Mother of God as the most powerful intercessor before the throne of Her Son in heaven. Her name puts us in relationship with her. She is not far away. She is close to us, as a mother should be, and she wants to be called upon by her children who are so in need of her. Saint Mary, may your holy name be always respected and honored, because you are closer to God than we are, because you know Him more intimately than we do, and because we trust that you will be with us now and at the hour of our death. Amen. THIS festival was appointed by Pope Innocent XI., that on it the faithful may be called upon in a particular manner to recommend to God, through the intercession of the Blessed Virgin, the necessities of His Church, and to return Him thanks for His gracious protection and numberless mercies. What gave occasion to the institution of this feast was a solemn thanksgiving for the relief of Vienna when it was besieged by the Turks in 1683. If we desire to deprecate the divine anger, justly provoked by our sins, with our prayers, we must join the tears of sincere compunction with a perfect conversion of our manners. The first grace we should always beg of God is that He will bring us to the disposition of condign penance. Our supplications for the divine mercies, and our thanksgivings for benefits received, will only thus be rendered acceptable. By no other means can we deserve the blessing of God, or be recommended to it by the patronage of His holy mother. To the invocation of Jesus it is a pious and wholesome practice to join our application to the Blessed Virgin, that, through her intercession, we may more easily and more abundantly obtain the effects of our petitions. In this sense devout souls pronounce, with great affection and confidence, the holy names of Jesus and Mary.